(Minghui.org) Falun Gong practitioners from Switzerland, Germany, and France held a Falun Gong Information Day in downtown Basel, the third largest city in Switzerland, on October 29, 2016. The activity exposed the persecution of Falun Gong by the Chinese Communist Party (CCP) and signatures were collected on a petition calling for an end to the CCP’s state-sanctioned organ harvesting from living practitioners. Falun Gong Information Day in Basel, Switzerland. Tourists in Basel sign a petition at Falun Gong Information Day. The activity was held on a road leading to two large commercial districts, next to the bridge on the Rhine. It happened to be the day a trade show was being held in Basel. Many Chinese people approached the Falun Gong booth. Some were on their way to the trade show, and some were students or tourists. Falun Gong practitioners took the opportunity to tell them the facts about the persecution, and helped many quit the communist organizations they had joined. One middle-aged Chinese man had heard about the persecution, but he hesitated to withdraw from the communist organizations at first. A practitioner told him the difference between loving the country and loving the Party, and that being patriotic didn’t mean he had to agree with the crimes of the Communist Party. The man thought it was right. He happily quit the Youth League, and took a picture with the practitioner before he left. Another middle-aged Chinese man greeted a Falun Gong practitioner, saying, “Good man!” He said that Falun Gong practitioners were very good people. The practitioner told him about the importance of seeing through the CCP’s lies about Falun Gong. The man said he had received truth clarification information through phone calls, flyers, and text messages in China. He had also seen Falun Gong activities overseas. After hearing about the significance of quitting the communist organizations, the man easily decided to quit the Youth League and the Young Pioneers. Local residents and tourists from other countries showed great support for Falun Gong practitioners’ work to stop the persecution. Mr. Chebili said it was terrible for the Chinese government to commit crimes such as organ harvesting, and that it was a crime against humanity. He said it challenged the basis of human rights. He asked, “What can I do to stop this crime?” He signed all the available petitions at the Falun Gong booth. Some people became interested in learning Falun Gong. Some pressed their hands in front of their chest to thank the Falun Gong practitioners. Attendees were greatly disturbed by the brutal persecution of Falun Gong in China, especially the Chinese Communist Party’s (CCP) harvesting of organs from living Falun Gong practitioners. Some were in tears. One of them said that she planned to visit China to look for the victims of the persecution and help them. A secretary of a non-governmental organization, who also serves as a consultant for the United Nations, said he was shaken by the film. He hopes more people can watch the film and help stop the killing. He also said that Falun Gong’s values should be respected by all people, and that practitioners represent justice. Another attendee said all people should watch this film and that it should be played on large screens, such as those in stadiums. He commented that the same terrible tragedy would happen again if people don’t remember lessons from history. Human Harvest, directed by Vancouver filmmaker Leon Lee, presented years of investigative work by David Matas, an international human rights lawyer, and David Kilgour, former Canadian Secretary of State for Asia-Pacific, on China’s organ harvesting from prisoners of conscience, who are mainly Falun Gong practitioners. (Minghui.org) Thirty-six Swiss lawmakers jointly signed a letter to the United Nations High Commissioner for Human Rights, Zeid Ra’ad Al Hussein, urging him to help move forward the lawsuits against Jiang Zemin for his role in the 17-year persecution of Falun Gong. Jiang Zemin, as then-head of Chinese Communist Party, launched the persecution in 1999, and personally directed the brutal campaign. Since May 2015, more than 200,000 Falun Gong practitioners throughout the world have filed lawsuits against Jiang to the Chinese Supreme Court. Meanwhile, several million people from multiple countries and areas, including China, have signed a petition calling upon the Chinese legal system to investigate Jiang’s crimes. Before signing the letter, Henry Rappaz, member of the Geneva Council, reminded people not to forgot that the world didn’t pay attention to the Nazis’ crimes until several million Jewish people lost their lives. He believes that it is time to take action to rescue the Chinese Falun Gong practitioners who have been suffering egregious human rights violations. The letter first praised the current anti-corruption campaign in China that has brought about the fall of numerous high-ranking government officials. The Swiss lawmakers believe that the campaign is a sign of improvement in the Chinese legal system. The letter pointed out the persecution started by Jiang Zemin in 1999 is extremely brutal, especially the state-sanctioned forced organ harvesting of Falun Gong practitioners. The letter informed Mr. Hussein that many organizations, including the UN, the EU Parliament, and other human right activists have made calls for the end of these organ harvesting crimes, with two millions signatures to date. The letter also called upon Mr. Hussein to encourage the Chinese president to indict Jiang and investigate his crimes, considering that more than 200,000 criminal complaints have been filed against him. The lawmakers emphasized that the whole world is watching the development of the lawsuits, and all are witness. Therefore, they are making the call so that history will witness the actions taken today to stop these crimes. Ten Swiss lawmakers sent a similar letter last August to the Chinese president directly, urging him to move forward with the lawsuits against Jiang. This time, the signers include 10 Federal Members of Parliament (MP), one former MP, one member of the Grand Council of the Canton of Geneva, a former member of the Grand Council, and 23 members of the Geneva Council. Massive smog hit China in December, and the severe air pollution drove a lot of Chinese people out of the country. Touring in Europe has been one way to escape the smog. Falun Gong practitioners warmly welcomed groups of “smog refugees,” and offered them comfort in the form of hope. “It is not easy to immigrate, but there are other measures you can take to help yourself,” the Falun Gong practitioner said to the group, and they were all ears. “The city government of Beijing announced the first smog red alert. As a former Beijinger, I really feel bad about this, although I live in Switzerland,” the practitioner said. “Half of China is now covered by smog, and the situation is getting worse. Whose fault is it?” the practitioner asked. “But there are also a lot of cars and factories in Europe, as you have seen on this trip,” the practitioner countered. Most of the tourists nodded. “This is a crime against humanity,” said one of the tourists who had heard about the state-sanctioned organ harvesting. “What can we do?” a tourist asked. Another day at the tourist spot, a Chinese woman tried to avoid this practitioner. The practitioner told her that the Communist Party is the root of all these problems. “There is a way to help yourself,” the practitioner said. “Have you heard about the movement of quitting the Party?” the practitioner asked. The woman said yes, but disapprovingly. “You should seriously consider this,” the practitioner said. They talked for a long time, and the practitioner told her about the sinister history of the Party. Finally, the woman was convinced and decided to quit the Party to take a stance against its crimes. The practitioner accepted the gift, and gave her a Swiss chocolate bar in return. 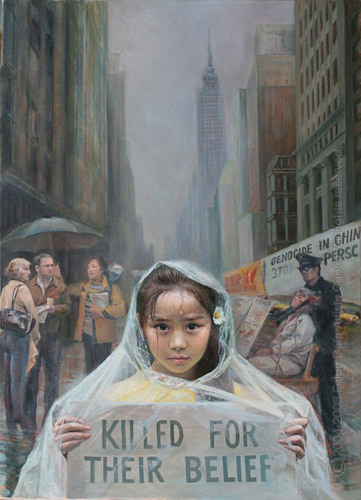 (Minghui.org) “I am deeply moved by the artworks for the rich content, especially the painting of a young woman who had bricks hanging on her neck. It touched my heart,” Commented Mr. Johann, who just visited the international art exhibition at Basel Art Center. The two-week Art of Zhen, Shan, Ren (Truthfulness-Compassion-Forbearance) International Exhibition opened on September 27, 2015 at Basel Art Center. The exhibition displayed the beauty of Falun Dafa, the brutality of the 16-year-long persecution in China, and the hope that practitioners remain steadfast in their beliefs while facing torture and murder. A comment in the guest book expresses appreciation for the artists and their efforts to inform the world about the persecution in China. Many visitors left comments in the guest book, thanking the artists for letting people know about the on-going massacre in China, and signed the petition to support stopping the forced organ harvesting, and the lawsuits against the dictator Jiang Zemin, who ordered the persecution. Visitors also saw the hope and the beauty of Falun Dafa in the artworks even though many of the paintings illustrated the brutality of the persecution. Many asked about Falun Dafa, and wanted to learn the exercises. (Minghui.org) Falun Gong practitioners in Switzerland held Information Day activities at Hirschenplatz and Limmatquai, two popular areas of Zurich, in July and August 2015. They provided information to the public about the benefits of Falun Gong cultivation practice and the Chinese Communist Party’s (CCP) brutal persecution of innocent Falun Gong practitioners in China. Many Zurich residents and tourists from around the world expressed their support for Falun Gong, and signed a petition calling for an end to the CCP’s forced organ harvesting from living Falun Gong practitioners. Photo exhibit at Limmatquai exposes the persecution of Falun Gong in China. A young boy reacts upon reading about atrocities committed in the persecution. Passersby sign a petition calling for an end to the persecution. Photo exhibit at Hirschenplatz exposes the persecution of Falun Gong in China. Toni and Nina learned about Falun Gong and the persecution for the first time. After signing the petition, Toni said, “What is happening in China [organ harvesting] is a despicable crime. It must stop!” Nina said, “It’s so brutal! Everyone has the right to live.” Both of them agreed that the persecution of Falun Gong shouldn’t have happened, and that people should enjoy freedom of belief. One of them wrote on the petition, “Such things shouldn’t be allowed to happen any more. Everyone should live without fear.” Toni hopes that more people will learn about the persecution and help stop the organ harvesting crimes. Over the course of the Information Days, many people learned about the benefits of practicing Falun Gong, and became interested in practicing it. Some took information about where to learn Falun Gong. Others took introductory materials for their family and friends. A number of people volunteered to help collect signatures. One woman told Falun Gong practitioners that her son had called her and asked her to come out and sign the petition. Tourists from China also took this opportunity to learn about Falun Gong. Some of them decided to quit the Chinese Communist organizations that they had joined before. Several visitors from China told practitioners that they were happy to see that practitioners in their cities had resumed doing the Falun Gong exercises. All who learned about the atrocities expressed the hope that the killing will soon stop. (Minghui.org) The 21st meeting of United Nations Human Rights Council was held from September 10 to 28, 2012 in Geneva, Switzerland. The Chinese Communist Party’s atrocities of organ harvesting from living Falun Gong practitioners were exposed during the meeting. Mr. Marc Falquet, President of the Human Rights Commission, Parliament of Canton of Geneva, Switzerland, issued a statement condemning the crimes of forced organ harvesting and calling on Chinese officials to take action to stop the crimes. An increasing number of Swiss Members of Parliament are now aware of, and extremely shocked by, the crimes perpetrated on such a large scale in China for the forced removal of organs. Truly, China today, due to its lack of morality, cannot be considered a great Power worthy of the name. Despite its economic strength, the criminal actions of members of the Chinese Government against its own people totally discredit that country in the eyes of the International Community. What can be said of a government which allows its own people to be assassinated for the large-scale forced removal and traffic in organs? More serious, more shameful still, Chinese citizens who practise a discipline to improve bodily and spiritual health and who try hard to live daily in peace are being assassinated with the complicity of the Chinese Government. I speak of course of Falun Gong practitioners. Concerning human rights, if the Chinese authorities wish to be respected by the International Community, they should set an example and immediately stop behaving like a gang of barbarians from the Middle Ages and the mentally retarded. Yes, Ladies and Gentlemen, a government which allows the most evolved and peaceful elements among its people to be assassinated can only be composed of worthless criminals and dangerous psychopaths who should think of undergoing treatment before the consequences of their crimes fall inevitably once again on their own heads. Neither wealth nor power makes the greatness of a human being but rather the moral qualities and courage to fight against his own weaknesses. Among the Chinese responsible, there must of course also be those honest and worthy individuals who feel shame in view of the barbarity perpetrated against their citizens. These honest people have the responsibility to take their courage in both hands, to openly denounce such odious criminal practices, so that the Chinese Government will rapidly and definitively end them.